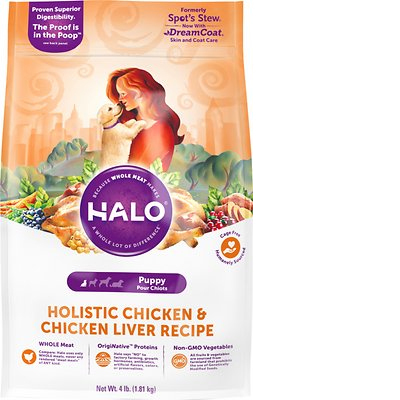 Halo Holistic Chicken & Chicken Liver Recipe is a high-priced dry dog food with exceptional quality. This product has 0 controversial ingredients, which also means no artificial preservatives, colors and flavor. The food has well-balanced amounts of protein, fat and carbs and also excellent meat and fat quality. Halo has a below-average number of recalls. Moreover, the company was very transparent when answering our questions. Watchdog Labs highly recommends this product. This product has a relatively high amount of calories. It’s important to understand how many calories you are feeding to prevent under or overfeeding. If your dog has fair to low activity levels, you may want to feed less than the labels recommend amount, since high-calorie foods like this are often feed to more active dogs who require a higher amount of daily calories. It's helpful to know that weight loss foods often have fewer than 340 calories per cup, weight maintenance foods typically range from 340-380 calories, and high-activity dog foods are usually over 400 calories. Keep in mind, puppy food, like this one, usually have much higher calories per cup than other foods. Chicken, Chicken Liver, Dried Egg Product, Oatmeal, Pearled Barley, Dried Peas, Pea Protein, Soy Protein Concentrate, Chicken Fat (Preserved With Mixed Tocopherols), Flaxseed, Pea Fiber, Natural Flavor, Dicalcium Phosphate, Calcium Sulfate, Dried Bacillus Coagulans Fermentation Product, Dried Blueberries, Dried Cranberries, Dried Carrots, Dried Sweet Potatoes, Calcium Carbonate, Salt, Dried Golden Algae, Inulin, Vitamins (Vitamin E Supplement, Niacin Supplement, Thiamine Mononitrate, D-Calcium Pantothenate, Vitamin A Supplement, Pyridoxine Hydrochloride, Ribofavin Supplement, Vitamin D3 Supplement, Vitamin B12 Supplement, Folic Acid, Biotin), Potassium Chloride, Minerals (Zinc Methionine Complex, Zinc Sulfate, Iron Proteinate, Ferrous Sulfate, Copper Proteinate, Copper sulfate, Manganese Proteinate, Manganous Oxide, Sodium Selenite, Calcium Iodate, Ethylenediamine Dihydroiodide), Taurine, Mixed Tocopherols (Preservative). Oats are a cereal grain and a source of carbs, protein, dietary fiber, several B vitamins and dietary minerals like manganese. They are a high-quality dog food ingredient that can potentially help with colon health. Oatmeal is oats that have been ground or cut. Halo has not included any controversial ingredients in this recipe. 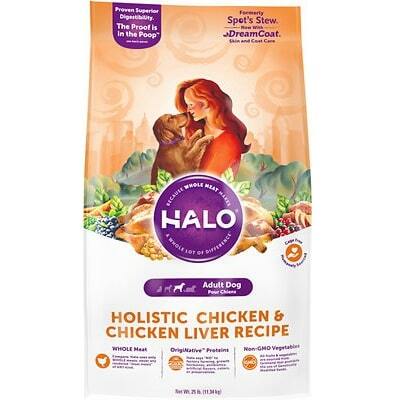 Halo clearly names the meat and protein sources in this food: Chicken, Chicken Liver and Dried Egg Product. This is great because it shows you the species the ingredient comes from. They are just as clear with the two fat sources chicken fat and flaxseed - both of them identify the source they come from. This Halo recipe does not contain any controversial preservatives. It’s good to know that ‍not all artificial preservatives are bad. That’s because they serve an important purpose, which is to prevent food from spoiling. However, we consider 11 artificial preservatives controversial because of their potential link to cancer and other serious health conditions. We did not find any dog food recalls for Halo, excellent. Halo was pretty responsive, taking only 2 days to respond. After a follow-up email, they have openly responded to all but one question. Our formulator for our meat-based diets has a Ph.D. in Nutritional Sciences from the University of Wisconsin and an MS in Biology from Wright University. He also has 30 years’ experience in Pet nutrition and nutritional research working for some of the major pet companies in America. For our Vegan products, we work with Dr. Sarah Dodd who is a certified Veterinarian with a Masters in Pet Nutrition and is working on her Ph.D. in pet nutrition. Both her Masters and Ph.D. are focused on plant-based nutrition for dogs. Unfortunately, the information cannot be given for the formulator. The only animal testing that Halo conducts is to ensure the palatability and digestibility of our recipes. Both tests are non-invasive and are done at an AAFCO recommended facility, which has been visited by our team to ensure animals are treated well. All the manufacturing facilities are located in the US, regulated by the FDA and are regularly inspected by the US government. All the production is done under our supervision and only ingredients specified by us and recipes developed by us are used. We have very strict quality guidelines. All our ingredients are received with certificates of analysis and undergo raw materials testing independent lab analysis and in-depth safety review prior to use. All lots are fully traceable and once they are produced, the finished product is re-tested and is not released for sale until new testing is completed. We do not own the manufacturing facilities. We do have confidentiality agreements with all our manufacturing facilities and cannot divulge who or where they are. But let me reassure you that all the production is done under our supervision and only ingredients specified by us and recipes developed by us are used. We have very strict quality guidelines. All our ingredients are received with certificates of analysis and undergo raw materials testing independent lab analysis and in-depth safety review prior to use. All lots are fully traceable. The reason why we do not divulge the information is simply to keep the information away from our competitors. It is our trade secret. Our product development team has and is arduously working to find the best ingredients and working with the best manufacturing facility for our recipes. This is the reason why Halo does not have the recalls all these big companies have. This is a reasonable response, but unfortunately, from a consumer perspective, it is troubling to not know who is making the product. None of our ingredients (including vitamins and minerals) come from China.